It's almost time, can you feel it? 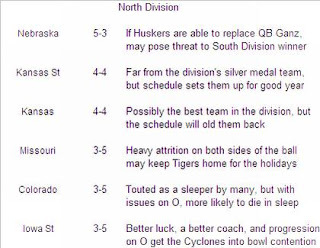 We're just a little more than 5 weeks away from kickoff of the 2009 college football season, so its time for my iron-clad predictions for each conference race. Since Twitter is all the rage with kids now, my predictions will come in scrumptuous, bite size blurbs. Rest asured though, a lot of thought, effort, and excel spreadsheets went into these predictons. After the predictions, I'll give you an interesting fact about each team you may not have known, followed by a short statistical prose about a player or team from the particular conference I happen to be previewing. Theres something for everyone here. If all you want is some nuggets of insight, you can be happily on your way, but if you want a more polished look at the conference feel free to stay and read the whole thing. I'm doing this Noah-style, as we'll go two-by-two until the season starts. 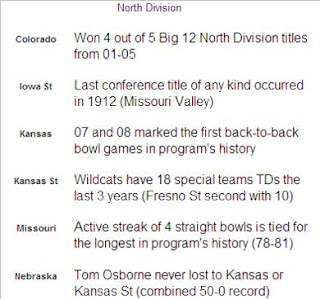 This week, we examine the Big 10 and Big 12. By all accounts, Javon Ringer had a pretty successful senior season at Michigan State. Ringer finished fourth in the nation in rushing yards (1637), fourth in rushing yards per game (125.92), and first in rushing touchdowns (22). The Spartans also won 9 games for the first time since 1999 (10-2). But did his coach (Mark Dantonio) hamper his performance and potentially his NFL future by giving him the ball too much? I think a cogent arguement can be made that he did. In the first 9 games of the season, Ringer carried the ball 300 times and gained 1373 yards for an average of 4.58 yards per rush. Ringer had 6 100-yard games and his low yardage total was 67 against Ohio State; a game in which the Spartans fell behind early and had to abandon the running game in a 45-7 loss. In the final 4 games of the season, Ringer carried the ball 90 times and gained only 264 yards for an average of 2.93 yards per rush. He had only a single 100-yard game and failed to average over 3 yards per rush in the other 3 games. I don't think there is any doubt Ringer tired as the season progressed. Did Ringer really need to carry the ball 34 times in an easy win over Eastern Michigan or 43 times in a shutout of Florida Atlantic? In the four-game span that included the aforementioned games as well as Notre Dame and Indiana, Ringer carried the ball 160 times! In addition, all this work was being piled on a back who is just a shade over 200 pounds and had carried the ball 453 times in the previous 3 seasons combined. 390 totes is just too many to give a college player, no matter how special they are. For point of reference, only 10 times in the NFL has a player been given 390 carries, and their season is of course, 3 games longer. 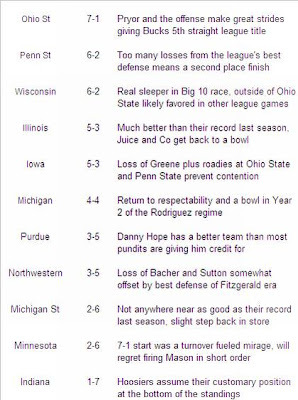 I hope for Mr. Ringer's sake that his career is not irreparably damaged by the beating Dantonio allowed him to absorb. I imagine the Tennessee Titans hope so as well. Aren't First Round Quarterbacks Supposed to be Good? Aside from the Raiders selection of Darrius Heyward-Bey, I thought the most questionable first round pick in the 2009 NFL Draft was Josh Freeman by the Tampa Bay Buccaneers. In the last 4 drafts, 10 quarterbacks have been selected in the first round. The chart below lists their numbers in their final season of college ball against BCS conference foes (and Notre Dame). Notice Joe Flacco is not on the list as he played his college ball at a IAA school (Delaware). Freeman has the lowest completion percentage, the third lowest yards per pass attempt, by far the fewest touchdowns, and the lowest quarterback rating of the bunch. Some might note the relatively pedestrian totals of Jay Cutler and Matt Ryan and posit that Freeman can make a similar transition to the NFL. I disagree for several reasons. For starters, Jay Cutler played at Vanderbilt, a school traditionally lacking top-end talent. Cutler probably fainted when he found discovered the caliber of players he would be able to throw to in Denver. Both Cutler and Ryan also played in conferences more conducive to defense than the 2009 incarnation of the Big 12. 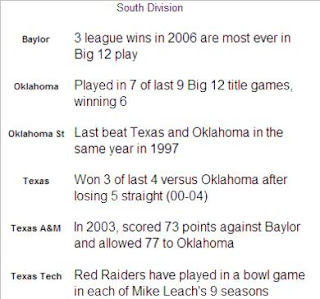 Big 12 teams allowed roughly 431 yards per game on average in league play last season. 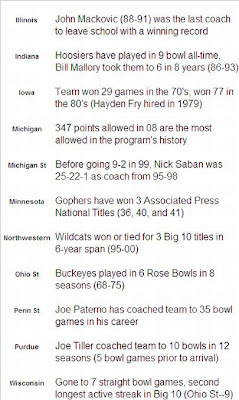 The second most offensive BCS league was the Big 10 where teams allowed about 352 yards per game in conference play. Finally, both Cutler and Ryan were seniors. Freeman left school a year early. Cutler and Ryan were 23 when they were in NFL training camps. Freeman is only 21. Asking him to develop in the professional ranks when he had trouble against Kansas and Colorado does not seem like the foundation on which Super Bowl dreams are built. It's almost time, can you feel it? 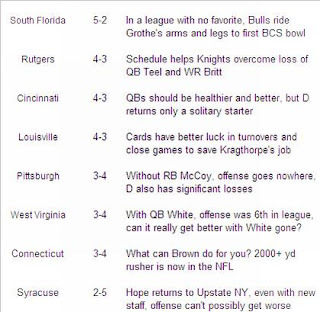 We're just a little more than 6 weeks away from kickoff of the 2009 college football season, so its time for my iron-clad predictions for each conference race. Since Twitter is all the rage with kids now, my predictions will come in scrumptuous, bite size blurbs. Rest asured though, a lot of thought, effort, and excel spreadsheets went into these predictons. After the predictions, I'll give you an interesting fact about each team you may not have known, followed by a short statistical prose about a player or team from the particular conference I happen to be previewing. Theres something for everyone here. If all you want is some nuggets of insight, you can be happily on your way, but if you want a more polished look at the conference feel free to stay and read the whole thing. I'm doing this Noah-style, as we'll go two-by-two until the season starts. First off are the ACC and Big East. Russell Wilson: An Encore Performance? Last season Russell Wilson was a big reason why NC State played in their first bowl game since 2005. He was the top-rated passer in the ACC and under his guidance, the Wolfpack had the league's second best offense. He was also dangerous with his feet, accounting for 388 yards and four touchdowns on the ground. However, what Wilson did better than any player in college football last season was avoid throwing interceptions. He threw one solitary in pick 275 passes, for a microscopic interception rate of 0.36%. Robert Hooke would have had trouble seeing that rate. How likely is Wilson to continue his vigilant ways with the football in 2009? To answer that question, I looked at all quarterbacks since 2004 who: were underclassmen that returned the folllowing season, threw at least 200 passes, and had an interception rate of 1.5% or less. I had to use 1.5% as the cutoff point because if we drop it any lower, there would be practically no sample. Wilson was certainly operating on a different level in 2008. Those criteria gave us 10 gentlemen: Omar Jacobs (Bowling Green 04), Reggie McNeal (Tx A&M 04), Matt Leinart (So Cal 04), Rudy Carpenter (Ari St 05), Stephen McGee (Tx A&M 06), Colin Kaepernick (Nevada 07), Drew Weatherford (Fla St 07), Tom Brandstater (Fresno St 07), Nate Davis (Ball St 07), Cullen Harper (Clemson 07). I threw out Weatherford because he didn't play significantly the following season (23 pass attempts as Christian Ponder took the reigns of the offense). Here are the combined stat lines of those 9 quarterbacks (sans Weatherford) in their low interception year along with Wilson's from last season. The first thing that jumps out at you is those other players were much more accurate passers than Wilson. Their combined completion percentage is nearly 8 percentage points better than Wilson's. Of those 9 players, only McNeal (58.1%), Kaepernick (53.8%), and Davis (56.5%) completed less than 60% of their passes. In fact, the 9 combined quarterbacks bested Wilson in every category except interception percentage. They averaged more yards per pass, threw touchdowns more often, and had a higher quarterback rating. Now here is what happened to those players the following season. On average, the quarterbacks stayed pretty good. Their completion percentage dropped a little, their yards per pass dropped a little, their touchdown percentage dropped a little, their interception percentage more than doubled, and their quarterback rating dropped a little. All the other stats dropped a little , but interception percentage changed the most. Why? I think its safe to say, all these quarterbacks enjoyed a modicum of good luck in their low interception season. Defensive players likely dropped a few picks and some were probably nullified by defensive penalties. In the next season, their luck just evened out. For the most part, these were still good players the following season (Cullen Harper is open to debate), but they were not able to duplicate their extreme performance. The same will more than likely be true for Mr. Wilson. He's already proven himself to be much less accurate than his peers, so a few of those passes that hit the turf in 08 will likely find their way into defender's hands in 09. That's not saying he won't be one of the top quarterbacks in the conference this season, as he most certainly should be provided he stays healthy, just that his interception total will likely 'balloon' at least compared to last season. One final note on this little study. The two players who declined the most from one season to the next, Carpenter and Harper, were also two of the three quarterbacks who had negative rushing totals in their low interception season (Matt Leinart was the other, but he had the benefit of playing alongside a stable full of future NFL players). Could elusive, athletic quarterbacks, be more likely to post low interception totals? Hopefully I'll find some time to answer this query in the near future. Sorry Big East fans, this won't be nearly as in-depth as the last issue. The Big East is by far the most wide-open BCS conference in 2009. Why? Look who's gone. Last season's two leading rushers (Donald Brown and LeSean McCoy) are gone. Syracuse, as if they needed any more bad news, is also without their own 1000-yard rusher from last season (Curtis Brinkley). Last season's two highest rated passers (Mike Teel and Pat White) are gone and Louisville and Connecticut also part ways with their starting quarterbacks (Hunter Cantwell and Tyler Lorenzen). Two of the league's three 1000-yard receivers (Kenny Britt and Dominick Goodman) are gone. The two players with the most sacks (Connor Barwin and Cody Brown) from last season are gone. The two players with the most tackles (Scott McKillop and Tyrone McKenzie) are gone. Three of the four defensive players with the most interceptions (Woodny Turenne, Mike Mickens, and Brandon Underwood) are gone. To say the league is in flux is an understatement. In bigger leagues, the personnel losses wouldn't be as significant, but when there are only 8 teams, attrition is magnified. My projection has South Florida taking the title, but if anyone other than Syracuse or Connecticut wins the championship, I wouldn't be surprised. In addition to the SDPI posts, another offseason interest of mine has been to look at how each IA conference has shaken out since 2005. 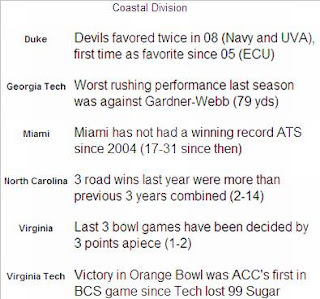 I chose 2005 as the starting point because that was the year the ACC expanded to 12 teams, the Big East added 3 new members and booted Temple, Conference USA added a championship game, the Mountain West added TCU, the WAC looted the Sun Belt after several of its members joined Conference USA, and the Sun Belt added 2 independents from Florida (FAU and FIU). Since 2005, there has only been one change in any IA conference. That was the expansion of the MAC by a single team with the addition of Temple. Our little sojourn concludes with a look at the Sun Belt, where Troy has done their best Boise State impression over the past three years. First here are the cummlative Sun Belt standings since 2005. Not surprisingly, the team that has won or shared three consecutive league titles also owns the best record in the conference over the past four seasons. Troy is 18-3 over the past three seasons and their three losses have come by 7, 6, and a single point. Six of the conference's eight teams have winning records in the league, meaning they have abused the league whipping boys (Florida International and North Texas) with great regularity. If we remove games against the Golden Panthers and Mean Green from the equation, the conference standings look like this. Middle Tennessee State has the worst record against those two squads at 5-3. Combined, the other six teams in the Sun Belt are 40-8 against Florida International and North Texas since 2005 (32-4 since 2006). Every team in the league save Florida International and North Texas has at least shared one conference crown. Troy of course has won three straight, but Florida Atlantic shared the title with Troy in 2007, Middle Tennessee State shared it with Troy in 2006, and Arkansas State, Louisiana-Monroe, and Louisiana-Lafayette all split the title in 2005. 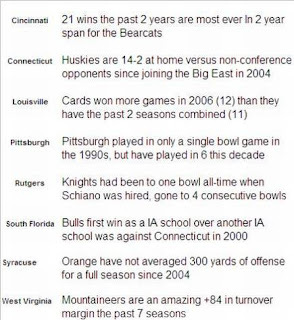 Now here is each team's home record in conference play since 2005. The Red Wolves from Arkansas State have set the pace for protecting their house in the Sun Belt. Troy is a close second at 11-3, just a single game behind. Only three teams have winning records at home (less than half the league). The biggest discrepancy between home and road record belongs to the Red Wolves. They are a fantastic 12-2 at home, but only 4-10 on the road, for a difference of 8 games. Now here is how homefield advantage shakes out in the Sun Belt (in conference play only) with respect to the nation at large (with rank out of the 11 IA conferences in parentheses). 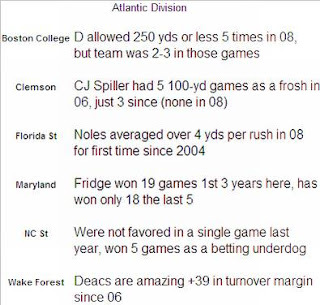 Homefield advantage has become more pronounced in the past two seasons. Home teams in the Sun Belt have won at a 60% clip in league play since 2007, while leading the nation in home winning percentage in 2008. Contrast that with 2005-2006, when home teams won only 45% of the time. It remains to be seen if 2008 was an outlier or a sign of things to come. Next up is how each Sun Belt team stacks up offensively for each season. This is the ranking of yards per game in conference play. The most consistently good offense in the Sun Belt has been the Ragin' Cajuns from Louisiana-Lafayette. Head coach Ricky Bustle, the former offensive coordinator at Virginia Tech, has seen his charges average over 250 yards per game on the ground in three of the past four seasons (lone exception was 2006). After finishing last in the Sun Belt in offense in 2005, Troy brought in offensive coordinator Tony Franklin to install one of those new fangled spread offenses and the results were pretty darn good. As you may have heard, Franklin headed across the state to Auburn where the spread didn't exactly take the league by storm. Part of that was personnel, part was attitude, and part was just plain bad luck. Franklin is now the offensive coordinator at Middle Tennessee State, a team that just happened to finish last in the Sun Belt in offense in 2008. Could history, in its idiosyncratic way, be alligned to repeat itself? 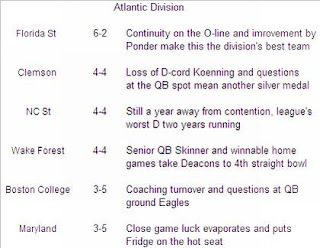 Florida Atlantic's rise from also-ran to contender alligns perfectly with the development of Rusty Smith-the best amateur quarterback in Florida not named Tebow. 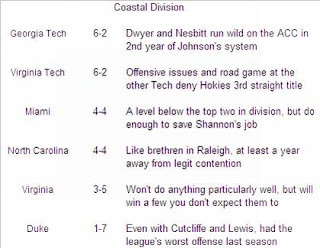 And finally, here are the defensive rankings for each team. This is yards allowed per game in conference play. Aside from a hiccup in 2006, Troy has been the standard bearer for defense in the Sun Belt. Arkansas State has also consistently been near the top of the Sun Belt defensive rankings, netting the silver medal three seasons running. On the other end of the spectrum is North Texas. 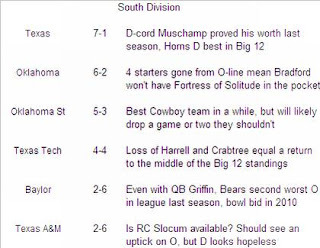 The Mean Green have yet to finish higher than sixth on defense the past four seasons.